Fluoresynth (sounds like “fluorescent”) generates a fundamental tone and 12 overtones. The relationship between the fundamental and its overtones determines the sound’s brightness and warmth. Fluoresynth sounds mellower when the overtones are much quieter than the fundamental tone. 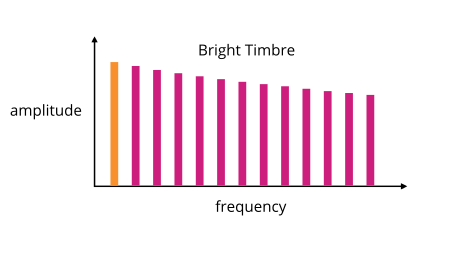 Turning up the overtones’ amplitude brightens Fluoresynth’s timbre. The Timbre slider controls the overtones’ amplitude. The waveform shape determines the distance between each overtone. You can control the waveform shape with the Waveform slider. Dense overtones produce warmer sounds. 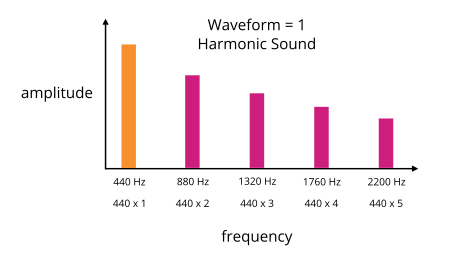 Fluoresynth can make both harmonic and inharmonic sounds. This feature sets Fluoresynth apart from other synthesizers only capable of harmonic sounds, like subtractive synthesizers. Setting the Waveform control to a whole number results in a harmonic sound. The frequencies of the overtones become integer multiples of the fundamental tone’s frequency. Setting the Waveform control to a fractional number results in an inharmonic sound. 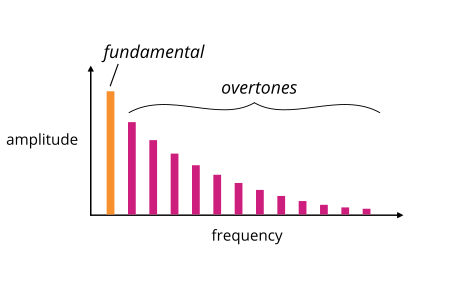 The frequencies of the overtones depart from integer multiples of the fundamental frequency. Inharmonic sounds are useful for creating unpitched tones, like in drums, percussion, or sound effects. Two envelopes control the Volume and Timbre amounts over the lifetime of each note. Five low-frequency oscillators control periodic Volume, Timbre, and Waveform changes, plus Vibrato and Stereo Panorama effects. You can synchronize all five low-frequency oscillators to the tempo of your song. All controls can be mapped to MIDI CC knobs or DAW automation clips for ultimate customization. 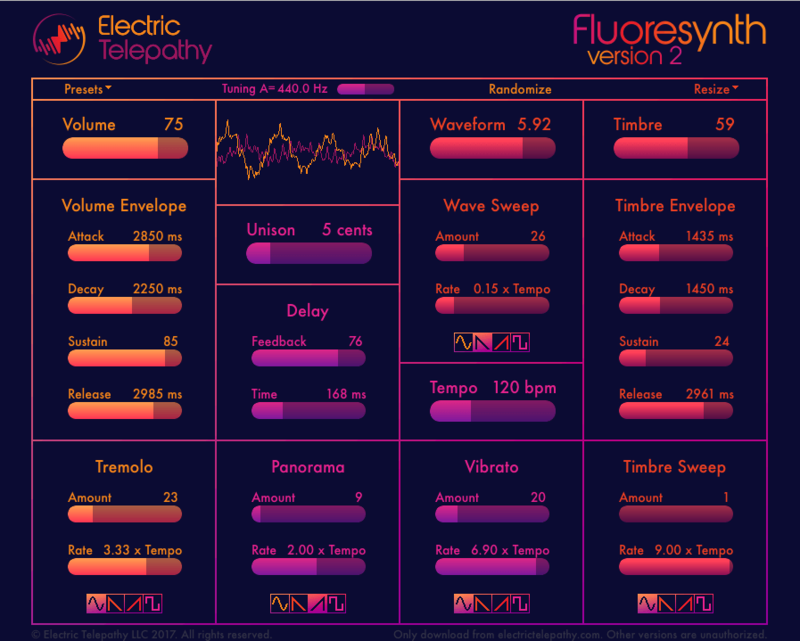 When we update Fluoresynth you get the new version for free! 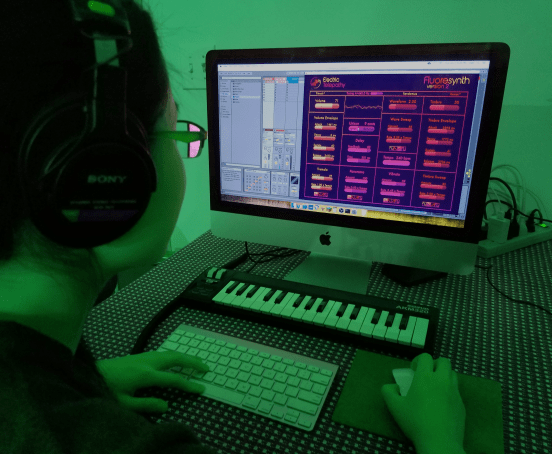 Musicians want to spend their time making music, not learning how to use a particular synth. Place your mouse over the sliders to see how each one changes Fluoresynth’s sound. Download the free trial to make sure Fluoresynth works on your system. No other synthesizer does what Fluoresynth can do. You will be inspired immediately. Just awesome! Definitely adding Fluoresynth to my sound engineering tools. Nothing else out there like it. I feel like I just became a better producer. So easy to use and just what I needed. As a novice to the world of sound engineering, this was just what I needed to get started. Thanks for making it easy! 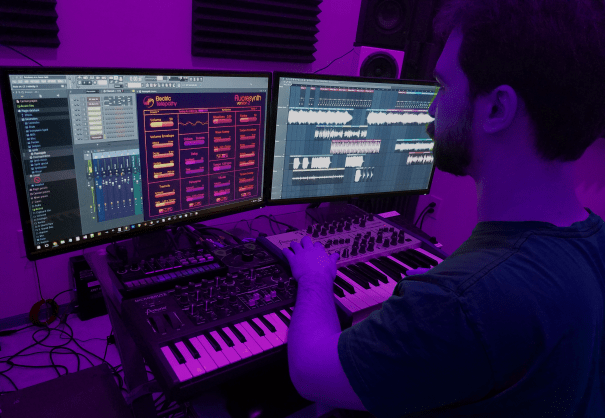 Even if you’re already familiar with synthesizer terminology and architecture, Fluoresynth is a great addition to the toolbox. It is simple and quick to program and almost everything you’d want to tweak is available on one screen.